It’s officially Draft Season here at the Nest! Fortunately, we’ve had the pleasure around here of not having to start thinking about the next year’s draft until late January the past two seasons (unlike dismal 2007, where we started thinking draft around November-ish). Admittedly, we take a very unscientific approach to our mock drafts. I’m the first to admit that the true draft geeks amongst you, dear readers, would probably be better served getting your information elsewhere (Glenn Clark, for one). These posts are done knowing full well that 1000’s of variables will come into effect between now and the time the Ravens turn in their pick for the first round, and that literally anything can happen. However, that being said, chances are we won’t be appreciably further off on our predictions than any of the other “gurus” out there will turn out to be. So, if you are just looking for some fun, informal information, we hope you’ll give us a look from time to time as the big April date approaches. We now know that the Ravens will be picking 25th (in the absence of any trading to be done of course) this year. As we typically do then, we’ll look at the 25th ranked player on some “big boards” from around the web. Scouts, Inc. has Robinson as their #2 ranked CB currently (Number 1 being Florida’s Joe Hayden). 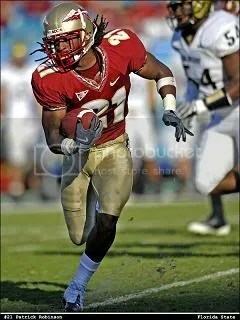 The senior, listed at 5’11” 194 lb, started 12 games for the Seminoles in 2009 and totaled 36 tackles while leading the team with 11 passes defended and two forced fumbles. He had six interceptions during his sophomore season in 2007, but then just 1 in 2008 and none in 2009. Perhaps this was a result of teams deciding to pretty much steer clear of Robinson after his big sophomore year, a la a Nnamdi Asomougha in the NFL. Ah, Mr. Tate. This is one that is sure to have Ravens fans salivating. Tate is the fourth WR on McGuire’s board, behind Damien Williams of USC, Dez Bryant of Oklahoma State, and Brandon Lafell of LSU. Tate, entering the draft following his junior season at ND, does not have prototypical WR size, though, at just 5’11” 195. He is quick off the line and is able to reach top speed (4.44) within a couple of steps. Tate uses moves and hands to get off press coverage. With excellent straight up speed and quickness, Tate is able to make the first defender miss on regular bases. Tate has good, strong hands, and is routinely showing off his ability to catch the ball away from his body. He does not fumble easy and has played for a conventional, drop back passer his whole career at Notre Dame. However, Tate needs to do a better job in the Red Zone. His footwork needs more polish and he is not the most physical wide out prospect. He tends to shy away from contact, and his route running also needs more development. Many Ravens fans would jump at the opportunity to have ANY first round WR talent on this roster, and there is no doubt, especially after the way the last two seasons have ended, that getting Joe Flacco more weapons needs to be at or near the top of the offseason priority list. However, we also need to be careful to not reach at WR – consider the last two wideouts this team has taken (and whiffed on) in the first round – Travis Taylor and Mark Clayton. Most agree that this draft class is stocked at the WR position, so waiting until round two or three may be the smart play here, rather than going with another sub-six footer on the outside. That’s it for the first installment of Mock Draft ’10 here at the Nest. There will be at least a few more in the coming months though, as we sift through the ridiculous amount of opinions floating around out there, so be sure to check back often. This entry was posted on January 31, 2010 at 1:27 pm and is filed under NFL Draft, Ravens. You can follow any responses to this entry through the RSS 2.0 feed. You can leave a response, or trackback from your own site. Not too sure about the WR’s in this draft class. Many of the big wigs (Kiper and McShay) are saying this is an extremely weak WR draft class. I am really hoping some e’ffing miracle can happen so we can just draft a CB and sign some nice free agent WR or make a trade. I’m still holding out hope because these rules are just down right not fair. 1. I think Ed will play in 2010. 2. The Ravens are pretty set at safety even if he doesnt, with Zibby and Haruki. While they obviously aren’t the talent that Berry is, I doubt they would give up so much to move into the top 10 for a position that they are already deep at. 3. IF they did want to give up all that (next year’s #1, probably this year’s #1) to move into the top 10, Dez Bryant should be the pick.